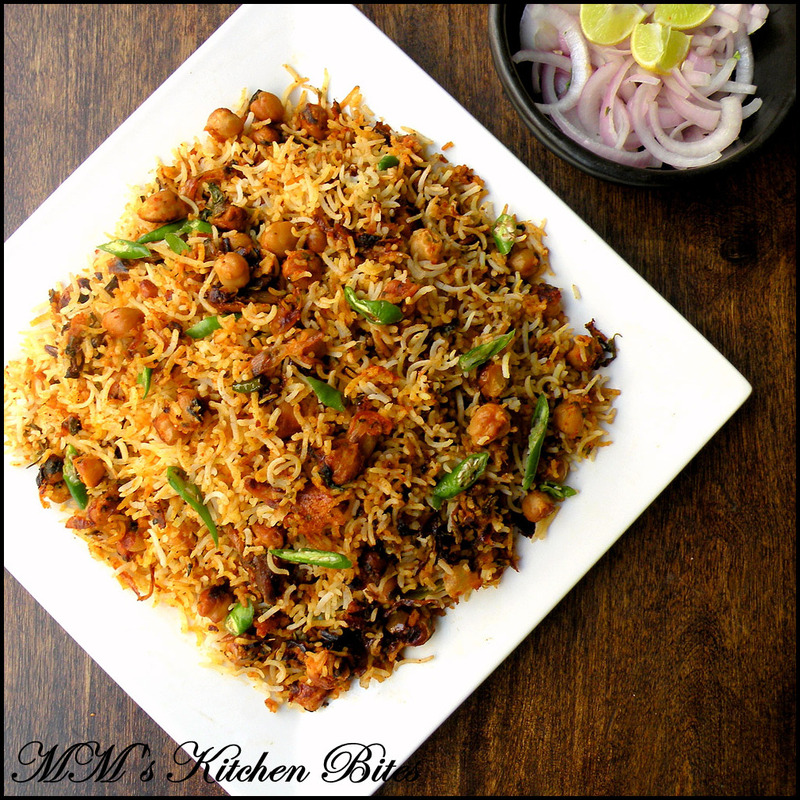 MM's Kitchen Bites: Chana Biryani...how my plan failed!! In a bowl, whisk the yogurt and add in the boiled chickpeas, ginger paste, red chili powder, kashmiri red chili powder, turmeric powder, green chilies, mint leaves, coriander leaves and salt. Mix well and keep aside. Wash the rice till water runs clear. Soak in cold water for about 20 minutes. Drain and boil the rice with bayleaf, cinnamon, black cardamom, green cardamoms, cloves, fennel seeds and salt till they are about 60-70 % done. Drain the rice in colander. Keep aside till cool. Soak saffron in warm milk, add in Kewra water (if using) and keep aside. Heat the oil in a pan and fry the sliced onion till turn golden brown. Add in the cumin seeds. Once they start sizzling, add in the chickpeas with the entire marinade. Stir well and let it cook on low flame for about 5-7 minutes. Switch off the flame. Take a heavy bottomed pan and brush the base and sides with oil. Place the chickpeas mix at the bottom and then layer on top with the boiled rice. Sprinkle saffron infused milk and coriander leaves on top. Cover with a tight fitting lid and cook over low indirect heat (pan placed over tawa) for about half an hour or so, until it steams and it's done. If making it in the oven. Preheat the oven to 175 C and bake covered with a tight fitting lid for about half an hour. Let it rest for about 5 minutes. Remove the lid, fluff up and mix the rice well with the chickpeas at the bottom with a fork. Important: In spite of coating the pan with oil, keep you fingers crossed and hope that some rice do get stuck to the sides and bottom of the pan, IMO the crusty crispy bits are the most delicious part of the biryani. You can either keep it all aside for yourself or if you are generous sort, sprinkle it on top of the serving plate! Serve hot, garnished with some chopped green chilies, coriander or mint leaves. interesting story & a great recipe !! I am so going to try this, it is my sis who told about this recipe to check here. will do that and knowing my sis she will be the first one to make as she often makes indian food than me. 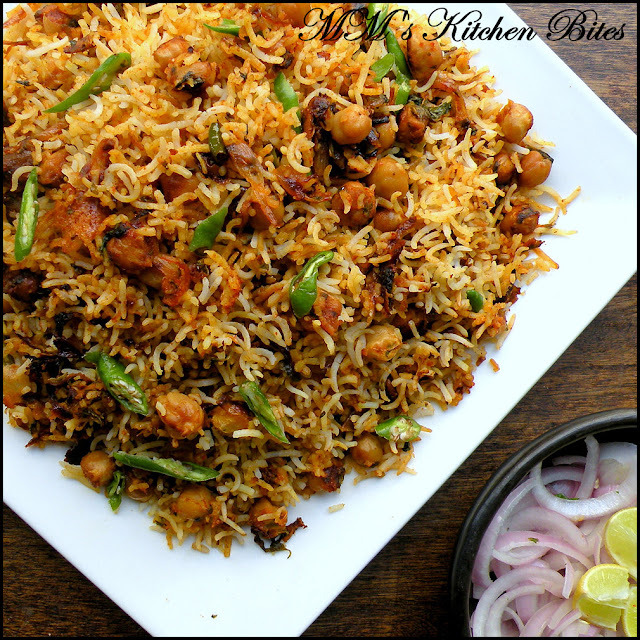 Wow Very Good Looking and Tasty Looking Biryani I will try this at home and do u have a recipe of Shrimp Biryani ?